February was an extremely active and successful month at Bendicion de Dios! Annemarie and I had a wonderful visit to Alotenango. There is so much going on it is hard to capture all the amazing enthusiasm, personal attention, and caring spirit that permeates the school’s activities in just this short note. The children, teachers, and administrators are constantly on the move. In addition to their normal classroom lessons, they make presentations to parents, hold contests for the best class and student, celebrate Carnival and other holidays, and keep the school clean and running smoothly. The school’s facilities have grown and changed as well. The new computer room (courtesy of Mark and Judith) is full of computers donated by the Rotary Club of Guatemala; and a new kitchen allows mothers to prepare the midday meal for all the students over a new stove inside the building instead of an open fire in the front courtyard. The primary school administrator, Glenda, has a new office although she rarely has time to sit down. A vocational education center with the new sewing room (in an alleyway two blocks from the school) is always busy with mothers and middle school students learning to sew on a host of sewing machines. Cooking classes are now offered to middle school students in the cooking classroom. And plans for the upstairs include a pizzeria/bakery by July. Plus Julio has made the final payment on another plot of land where he hopes to build a middle school and medical clinic. In terms of volunteers, Jenaro Fueyo Garcia and Mercedes made their annual visits. Jenaro is now helping Leonel with his special needs class and providing English instruction to the teachers. Mercedes continues to watch the height, weight, growth and general health of all the students. Julie Long from Framingham (formerly of the Barbieri School) is taking a gap year before college and came for a three-month stay, helping Claudia in second grade. Rebecca visited for winter break with some friends. 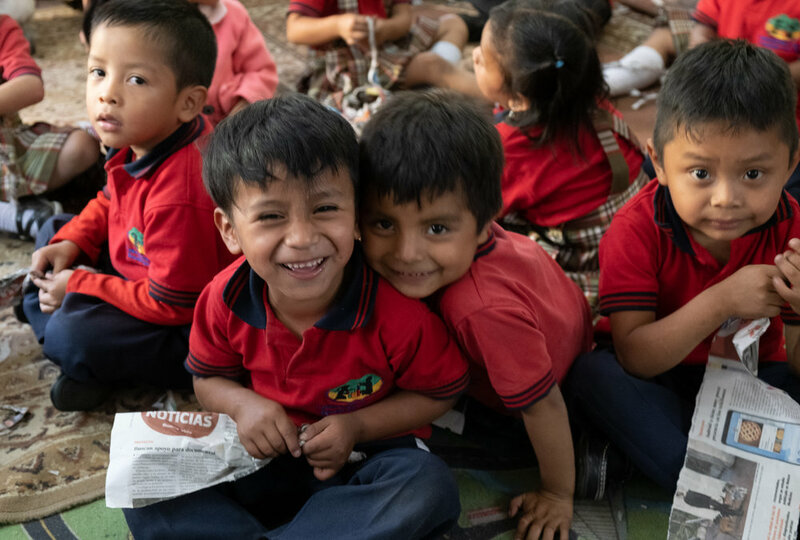 She spent time at the school and renewed her connections with suppliers in Antigua, Panajachel and Santiago Atitlan. In addition this trip brought David Kent, Maria De Felice, Bill Leary, and Alex Kent from MakerSpace Framingham, along with Patiño Vazquez of Fireseed Arts to the school for the first time. Through the generosity of Framingham MakerSpace members, David, Bill and Patiño set up two carpentry workbenches and Alex made shelves and an A frame for storing tools and safety equipment. Six boys and six girls (a pilot carpentry class) worked with electric drills, screwdrivers and sanders to make “cajones” (a Peruvian drum shaped like a box) under Patiño’s direction. With his help they learned to play, composed their own song and gave a concert to the elementary school, all in a week. The carpentry class will become part of the regular middle school vocational curriculum, along with sewing and cooking. David and Bill also installed “Scratch”, a computer program that teaches children how to program. Bill and David demonstrated the program and taught Rosario, the computer education teacher, how to use and teach the program. Julio is planning on sending Rosario to computer class to be able to offer a certificate in computer programming for middle school students. Students would be required to pass around 460 to 480 hours of computer class per year for three years in order to obtain their certificate. Danielle Ringenary and Nicole Grassey brought dental supplies donated by Danielle’s employer, Kessler Dental. The children received instruction in proper dental hygiene, especially enjoying the idea of brushing your tongue. Everyone appreciated the new toothbrushes and toothpaste (the little children whose mothers were cooking managed to charm their way into receiving them as well). 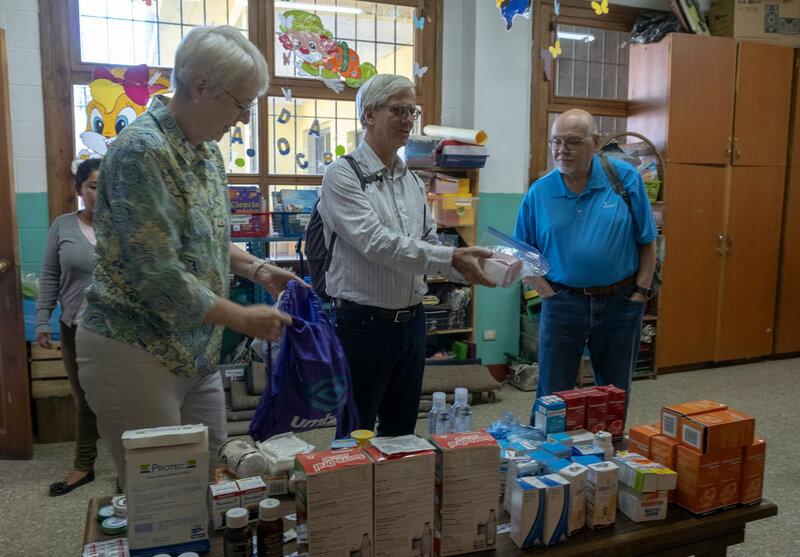 Dr. Kathy Meehan came for a few days with her husband, Ron Kupke, and held a medical clinic in a partitioned half of the second grade classroom. After listening to the mothers and children describe their symptoms, she dispensed pain relief, antibiotics, and other medicines that the school supplied. While there were a couple of serious cases (diabetes, an eye infection, and a recent mother who was having difficulty breast feeding), most complaints were the aches and pains of viral infections and acid indigestion. She was impressed with the children’s level of basic health. She saw around 15 to 20 mothers (and children) a day for three days. 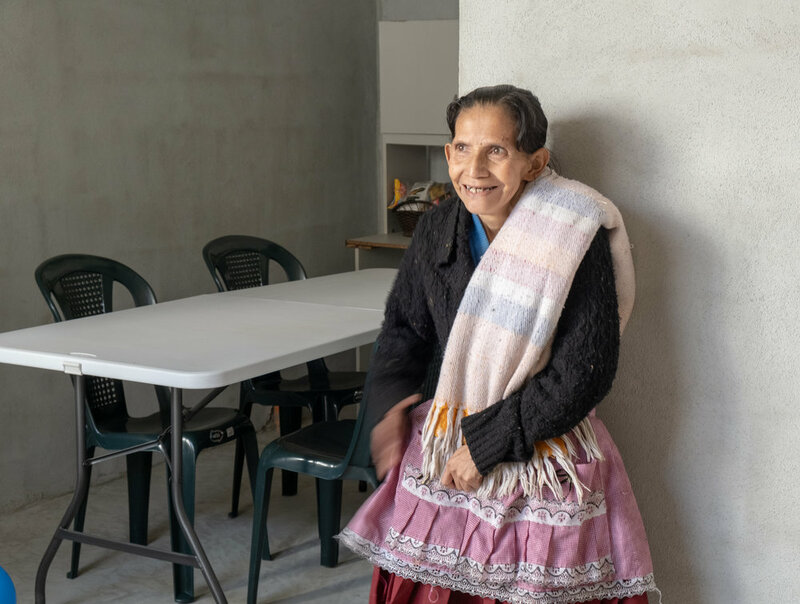 One of the greatest recent accomplishments is the completion of a splendid new home with a kitchen, bathroom and three bedrooms for Abigail and her four children (three daughters, one of whom is mentally handicapped, and a son, Patricio). This home was built by donations from Guatemalan sponsors, Pedro and Jimena, along with their friends. Jenaro Garcia and his Spanish friends paid for all the furniture, beds, and kitchen equipment. Abigail goes to Antigua every day with her handicapped child to sell plants on a street corner to make money. She is slight and frail, and in poor health. The Association owns the land and building, but has entered into a contract with the family to let them stay in the home for life. After talking with David and Maria during their visit, Julio has embarked upon another venture that he had been pondering: providing housing for 15 to 20 families who otherwise could never have their own home. The land and buildings will be owned by the Association, but leased under a long-term contract to the family. Julio has identified a couple plots of land that he is considering, and MakerSpace Framingham provided funds for an initial down payment. Plans are underway to hold a fundraiser May 11, 2019 to raise the remaining balance to purchase the land. As part of our luggage (along with Rebecca, Kathy, and Julia) we brought 200 pounds of Legos, school supplies and clothes for the school. Ten of our sponsors sent gifts to their child or children, which we delivered in the front courtyard taking pictures for the sponsors to see. 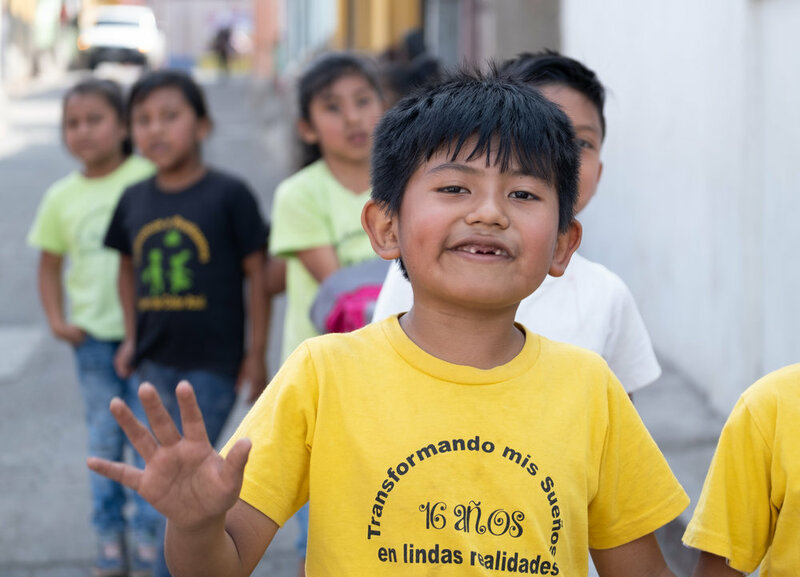 Julio accepted the Legos, which will be distributed among the classrooms, and the clothes will be sold during the monthly thrift sale that Julio holds in the front of the school to raise funds and provide inexpensive clothing to the community. All in all it was a busy and rewarding month!